In a 2001 survey of the Turkish coast led by George Bass, a local dive operator and former archaeologist with the Bodrum Museum, reported what he believed to be a Greek shipwreck at Orak Adası, not far from Bodrum. On October 9 Aşkın guided INA research vessel Virazon and its crew to the location of the reported wreck, which was actually off Pabuç Burnu (Shoe Point), just west of Orak Adası. Lead by Aşkın, INA’s Don Frey, Mutlu Gunay, and Ministry of Culture representative Yaşar Yıldız dived on the site to make an initial assessment and a short video for documentation. 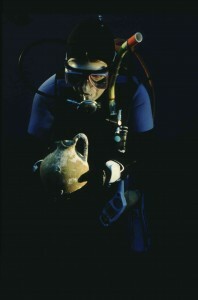 The Smothers-Bruni expedition to Pabuç Burnu excavated at the site from June through October in 2002 and again in June and July in 2003. Due to the proximity of the site to Bodrum, INA’s headquarters served as an excavation base. Each morning the team boarded Virazon and made the 45-minute trip southeast past Kara Ada to Pabuç Burnu. A permanent mooring over the site was established to hold Virazon. 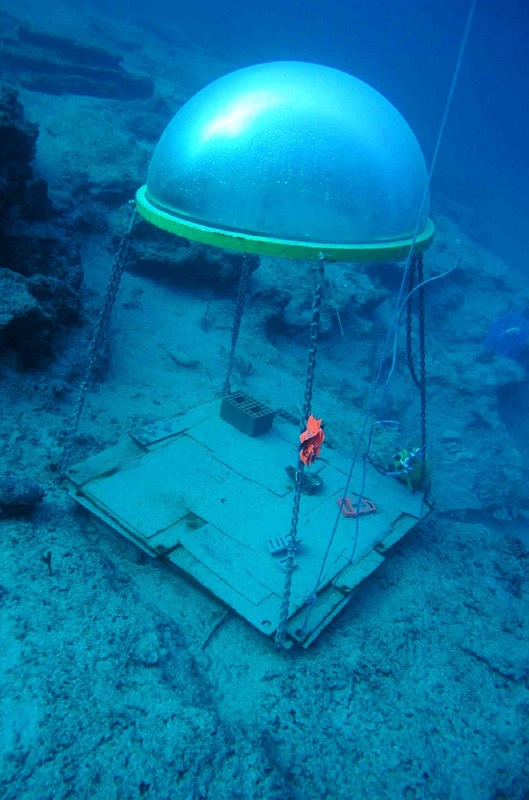 The team prepared the site for excavation and mapping by installing the underwater “telephone booth” and safety tanks, assembling and floating airlift pipes, locating datum towers at strategic positions, and erecting a nylon rope grid demarking rows of 2X2-meter squares across the excavation area. Precise relative locations of the datum points––the basis for all subsequent mapping––were established with measuring tape and the Site Surveyor™ program. Thereafter, artifacts were mapped using digital photography and PhotoModeler Pro™, a program that renders three-dimensional coordinates for points using photogrammetry. At the end of each field season, all intact artifacts were transferred to the Bodrum Museum to complete their desalination and undergo conservation. The hull planks and partial amphoras remain in the Nixon Griffis laboratory, where they have been desalinated and cleaned and are being studied. The hull wood is currently undergoing conservation with polyethylene glycol (PEG) in the new treatment tank and system designed by Robin Piercy. Bass, G.F. 2002. 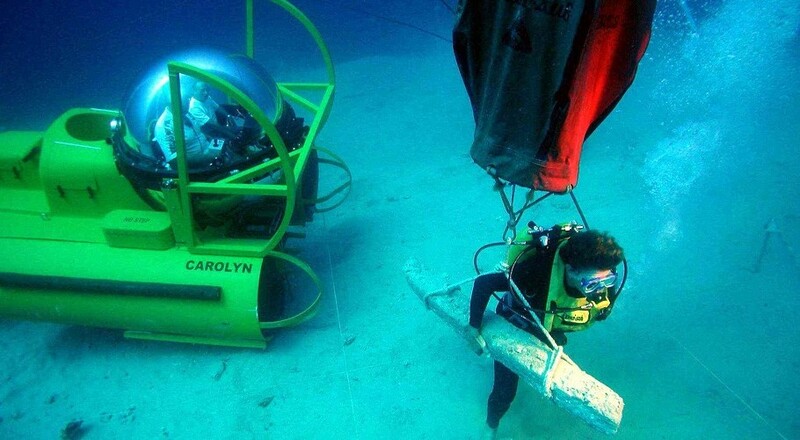 Log of the Submersible Survey 2001. the INA Quarterly 29.2: 3-9. Greene, E.S. 2003. Endless Summer: The 2002 Excavation Season at Pabuç Burnu, Turkey. the INA Quarterly 30.1: 3–11. –––––. 2005. An Archaic Ship Finally Reaches Port. In Beneath the Seven Seas: Adventures with the Institute of Nautical Archaeology, edited by G. F. Bass, 59–63. London: Thames and Hudson. Greene, E.S. and G.F. Bass. 2002. Yili Pabuç Burnu Kazisi Ön Raporu (Preliminary Report of the 2002 Excavation at Pabuç Burnu). Kazi Sonuçlari Toplantisi 25.2: 187–94. –––––. 2002. Excavating a Sixth-Century B.C. Shipwreck at Pabuç Burnu (Pabuç Burnu’nda milattan önce VI. yüzyila ait bir gemi batigi kazisi). Sualti Bilim ve Teknoloji Toplantisi: Bildiriler Kitabi (Istanbul): 259–78. Greene, E.S. and M.E. Polzer. 2004. Evidence for A Sixth-Century BCE Lifeboat and its Anchor? the INA Quarterly31.3: 12–8. Polzer, M.E. 2004. An Archaic Laced Hull in the Aegean: The 2003 Excavation and Study of the Pabuç Burnu Ship Remains. the INA Quarterly 31.3: 3–11. Greene, E.S. 2004. The Shipwreck at Pabuç Burnu, Turkey: An Archaic Wreck in the Eastern Mediterranean. ASOR Annual Meeting, November (2004), San Antonio, Texas. –––––. 2004. The Late Sixth-Century B.C. Shipwreck at Pabuç Burnu, Turkey. 105th Annual Meeting of the American Institute of Archaeology, January (2004), San Francisco, California. –––––. 2005. Shipwrecks, Archaic Trade, and the Excavation at Pabuç Burnu, Turkey. 106th Annual Meeting of the American Institute of Archaeology, January 6–9 (2005), Boston, Massachusetts. Greene, E.S. and G.F. Bass. 2002. Excavating a Sixth-Century B.C. Shipwreck at Pabuç Burnu. Underwater Research and Technology Meeting, November (2002), Bogaziçi University, Istanbul, Turkey. –––––. 2003. 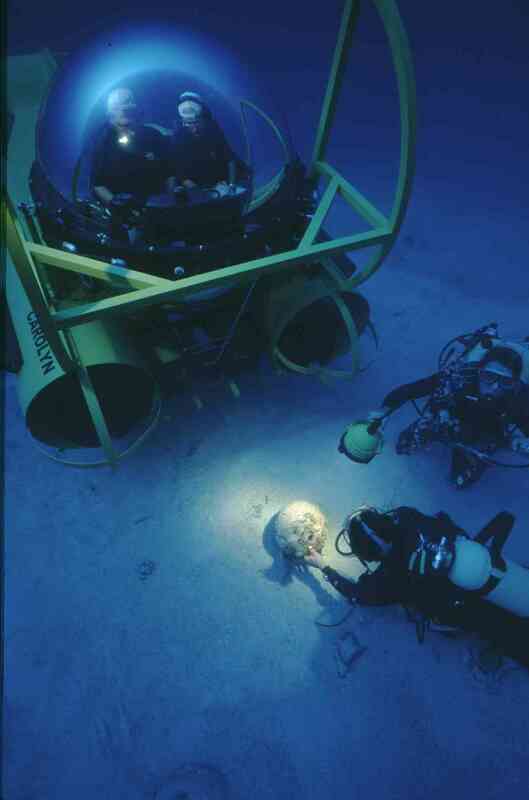 Discovery and Excavation: The 2001 Submersible Survey and the 2002 Excavation at Pabuç Burnu, Turkey. TROPIS 2005––8th International Symposium on Ship Construction in Antiquity, August (2002), Hydra, Greece. Greene, E.S. and M. Lawall. 2006. Amphora capacities in early monetary Asia Minor: the Pabuç Burnu shipwreck. In Poseidons Reich XI, February 17–19 (2006), Frankfurt, Germany. Polzer, M.E. 2004. The INA Shipwreck Excavation at Pabuç Burnu: The 2003 Campaign. The 26th International Symposium of Excavations, Surveys and Archaeometry, May 24–28 (2004), Selçuk University, Konya, Turkey. –––––. 2005. Hull Remains from the Archaic Shipwreck at Pabuç Burnu, Turkey: Signs of Shifting Technology? 106th Annual Meeting of the American Institute of Archaeology , January 6–9 (2005), Boston, Massachusetts. –––––. 2005. Laced Hull Remains from the Sixth-Century B.C. Shipwreck at Pabuç Burnu, Turkey. TROPIS 2005––9th International Symposium on Ship Construction in Antiquity, August 25–30 (2005), Agia Napa, Cyprus. ABOVE: (Left) Mutlu Gunay removes an amphora from the site at Pabuç Burnu for recording and dating purposes (Photo by D. Frey). (Center) Telephone booth installed on the wreck site (Photo by D. Frey). (Right) Feyyaz Subay raises an intact oinochoe he found buried under an amphora during the initial investigation of the Pabuç Burnu site (Photo by D. Frey).